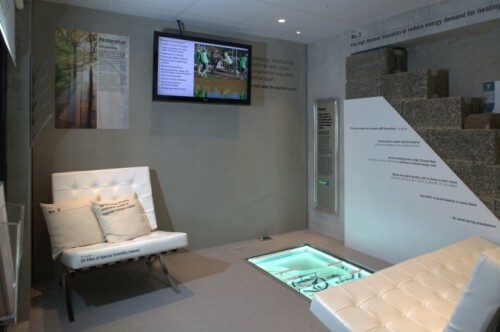 Following on from the success of Lafarge’s Fibonacci inspired, limited edition book, which we designed to support their stand at the 2011 Ecobuild exhibition; We were very excited to have been invited to work with them on this year’s Cool Concrete exhibition. More than a year ago Lafarge decided to build a life-sized representation of a concrete home based on the famous Barcelona Pavillion by Ludwig Mies van der Rohe. 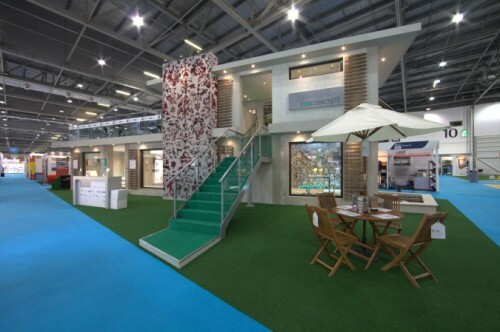 The stand demonstrates a practical solution for sustainable housing and informs buyers of the range of innovative products and materials that are available from their aggregates and concrete, asphalt and cement divisions. Lafarge built their Cool Concrete house by abiding to their 20 rules of sustainable construction. We had a huge task ahead of us designing the brand identity, a thank you and a spiral bound VIP sketchbook which was designed to aid in planning building work from concept to reality. The internal and external exhibition graphics for the stand along with promotional materials and postcards were also part of this exciting design brief. With nearly two hundred individually designed graphic elements in the Cool Concrete home, we ensured a clear and consistent style throughout emphasising the 20 rules. We wanted customers to interact with the house and the sustainable materials it had been created with. We designed fun graphics to create interest and applied these onto blinds, cushions and chalkboards, along with vinyl wall graphics depicting furniture to help the customer to visualise a real home. The project was designed, art worked, manufactured and installed in just over two weeks! We were delighted to hear that Lafarge have won the award for most sustainable stand by the UK Green Building Council at Ecobuild. Check out the link below to photographer Tristan Poyser’s time lapse video of the Lafarge Cool Concrete home building constructed.